SKU: N/A. Category: Advance. Tags: +, Advance, Growth, Large Breed, Puppy Plus. Advance Puppy Plus Growth Large Breed. 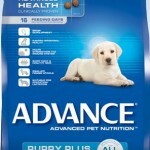 Advance Puppy Plus Growth Large Breed Contains The Highest Quality Australian Chicken. 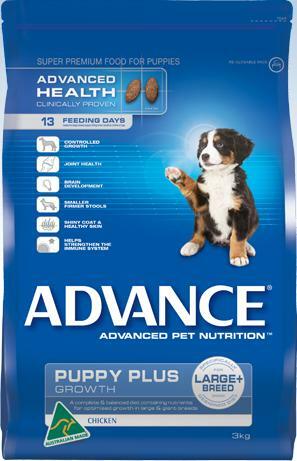 Advance Puppy Plus Growth Large Breed, A complete and balanced diet containing nutrients for optimised growth in large and giant breeds. ADVANCE Puppy Plus Growth Large Breed diet is specifically designed to achieve the optimum growth rate in large and giant breeds, through restricted calories and controlled calcium/phosphorus ratios. 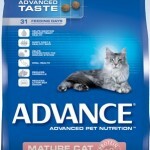 ADVANCE Puppy Plus Growth Large Breed diet contains Stabilised Green-Lipped Mussel Powder (SGLMP). SGLMP is a natural source of glucosamine, chondroitin sulphate, and omega 3 fatty acids, which has been clinically proven to help manage joint health. Chicken. Rice. Corn Gluten. Corn. Sorghum. Chicken Tallow. Chicken Digest. Tuna. Sunflower Oil. Beet Pulp. Iodised Salt. Potassium Chloride. Inulin. Choline Chloride. Turkey. Taurine. Plant Extracts (Tomato Powder (source of Lycopene). Marigold Meal (source of Lutein). Green Lipped Mussel Powder. Vitamin E. Dicalcium Phosphate. Zinc Sulphate. Vitamin C. Citric Acid. Beta-Carotene. Antioxidants. Iron Sulphate. Copper Sulphate. Vitamin B5. Vitamin A, Vitamin B2, Vitamin B12, Potassium Iodide, Vitamin B1, Vitamin B3, Selenium, Vitamin B6, Vitamin B9.